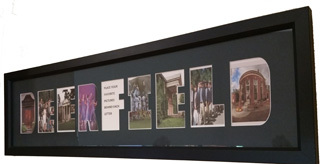 DEERFIELD name matted frame with 9 letter shaped openings to fit your favorite 2 1/4" x 4" photos. Black wood and glass frame with green matting. Back flex points to hold matting in place. Sawtooth frame hanger on back.